This is in the top 5 of my favorite photographs I have taken. 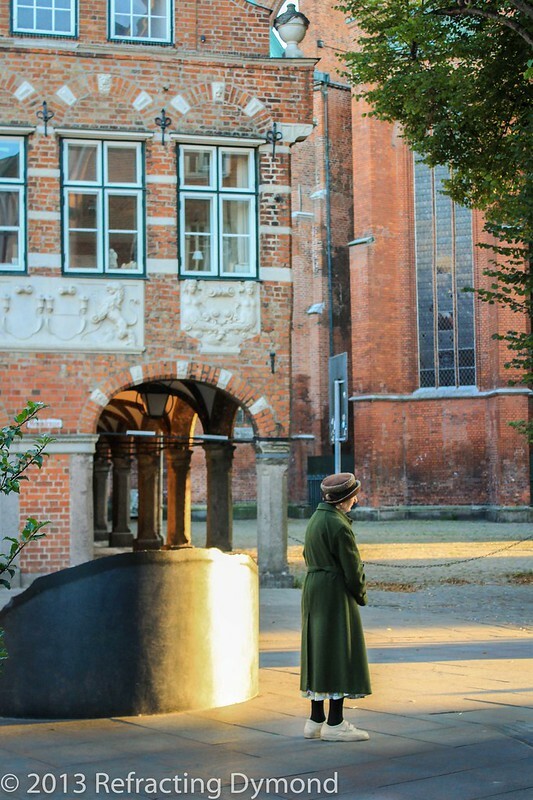 While playing tourist in Lübeck, Germany, thinking I was done with photos for the day, I turned around to see this woman standing there in the light of the setting sun. She seemed out of place. There was the typical hustle and bustle of a summer evening in a small city, she was still. Most sought out places not in direct sunlight, she was facing the sunset. Most were in light summer clothes, she had a long coat on. Originally I had a sense of loneliness watching her, but others have commented that maybe she was happily reflecting on something, or just enjoying the sunset. In any case, I find this picture to be very moving. I read on a photography blog that when you are done shooting, you should always put the camera back in automatic mode. I try to follow that advice and moments like this are why. I did not have time to adjust the settings. I only had time to take the lens cap off and shoot. I got a few pictures before the woman walked away. I would have preferred to adjust my own settings to get an ideal shot, but the picture came out good enough. I wish I knew where I read that advice so I could that that photographer. It was one of the best pieces of advice I have read!